For the marketer of Gulf-branded gasoline in the United States, see Gulf Oil LP. Gulf Oil was a major global oil company from the 1900s to the 1980s. The eighth-largest American manufacturing company in 1941 and the ninth-largest in 1979, Gulf Oil was one of the so-called Seven Sisters oil companies. Prior to its merger with Standard Oil of California, Gulf was one of the chief instruments of the Mellon family fortune; both Gulf and Mellon Financial had their headquarters in Pittsburgh. Gulf's former headquarters, originally referred to as "the Gulf Building" (now the Gulf Tower office condos), is an art-deco skyscraper. The tallest building in Pittsburgh until 1970, when it was eclipsed by the U.S. Steel Tower, it is capped by a step pyramid structure several stories high. Until the late 1970s, the entire top was illuminated, changing color with changes in barometric pressure to provide a weather indicator that could be seen for many miles. Gulf Oil Corporation (GOC) ceased to exist as an independent company in 1985, when it merged with Standard Oil of California (SOCAL), with both re-branding as Chevron in the United States. Gulf Canada, Gulf's main Canadian subsidiary, was sold the same year with retail outlets to Ultramar and Petro Canada and what became Gulf Canada Resources to Olympia & York. However, the Gulf brand name and a number of the constituent business divisions of GOC survived. Gulf has experienced a significant revival since 1990, emerging as a flexible network of allied business interests based on partnerships, franchises and agencies. Gulf, in its present incarnation, is a "new economy" business. It employs very few people directly and its assets are mainly in the form of intellectual property: brands, product specifications and scientific expertise. The rights to the brand in the United States are owned by Gulf Oil Limited Partnership (GOLC), which operates over 2,100 service stations and several petroleum terminals; it is headquartered in Framingham, Massachusetts. The corporate vehicle at the center of the Gulf network outside the United States, Spain and Portugal is Gulf Oil International, a company owned by the Hinduja Group. The company's focus is primarily in the provision of downstream products and services to a mass market through joint ventures, strategic alliances, licensing agreements, and distribution arrangements. Gulf Oil International has its head office in the City of Westminster, London. The business that became Gulf Oil started in 1901 with the discovery of oil at Spindletop near Beaumont, Texas. A group of investors came together to promote the development of a modern refinery at nearby Port Arthur to process the oil. The largest investor was William Larimer Mellon of the Pittsburgh Mellon banking family. Other investors included many of Mellon's Pennsylvania clients as well as some Texas wildcatters. Mellon Bank and Gulf Oil remained closely associated thereafter. The Gulf Oil Corporation itself was formed in 1907 through the amalgamation of a number of oil businesses, principally the J.M. Guffey Petroleum and Gulf Refining companies of Texas. The name of the company refers to the Gulf of Mexico where Beaumont lies. 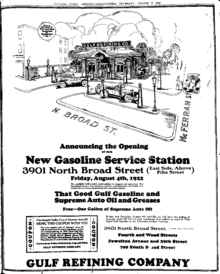 1922 newspaper ad for a new Gulf station in Philadelphia, with a close view of the station. Output from Spindletop peaked at around 100,000 barrels per day (16,000 m3/d) just after it was discovered and then started to decline. Later discoveries made 1927 the peak year of Spindletop production, but Spindletop's early decline forced Gulf to seek alternative sources of supply to sustain its substantial investment in refining capacity. This was achieved by constructing the 400-mile (640-km) Glenn Pool pipeline connecting oilfields in Oklahoma with Gulf's refinery at Port Arthur. The pipeline opened in September 1907. Gulf later built a network of pipelines and refineries in the eastern and southern United States, requiring heavy capital investment. Thus, Gulf Oil provided Mellon Bank with a secure vehicle for investing in the oil sector. Gulf promoted the concept of branded product sales by selling gasoline in containers and from pumps marked with a distinctive orange disc logo. A customer buying Gulf-branded gasoline could be assured of its quality and consistent standard. (In the early 20th century, non-branded gasoline in the United States was often contaminated or of unreliable quality). Gulf Oil grew steadily in the inter-war years, with its activities mainly confined to the United States. The company was characterized by its vertically integrated business activities, and was active across the whole spectrum of the oil industry: exploration, production, transport, refining and marketing. It also involved itself in associated industries such as petrochemicals and automobile component manufacturing. It introduced significant commercial and technical innovations, including the first drive-in service station (1913), complimentary road maps, drilling over water at Ferry Lake, and the catalytic cracking refining process (Gulf installed the world's first commercial catalytic cracking unit at its Port Arthur, Texas, refinery complex in 1951). Gulf also established the model for the integrated, international "oil major," which refers to one of a group of very large companies that assumed influential and sensitive positions in the countries in which they operated. In Colombia, Gulf purchased the Barco oil concession in 1926. The government of Colombia revoked the concession the same year, but after much negotiation Gulf won it back in 1931. However, during a period of over-capacity, Gulf was more interested in holding the reserve than developing it. In 1936 Gulf sold Barco to the Texas Corporation, now Texaco. Gulf had extensive exploration and production operations in the Gulf of Mexico, Canada, and Kuwait. The company played a major role in the early development of oil production in Kuwait, and through the 1950s and '60s apparently enjoyed a "special relationship" with the Kuwaiti government. This special relationship attracted unfavourable attention since it was associated with "political contributions" (see below) and support for anti-democratic politics, as evidenced by papers taken from the body of a Gulf executive killed in the crash of a TWA aircraft at Cairo in 1950. In 1934, the Kuwait Oil Company (KOC) was formed as a joint venture by British Petroleum and Gulf. Both British Petroleum and Gulf held equal shares in the venture. KOC pioneered the exploration for oil in Kuwait during the late 1930s. Oil was discovered at Burgan in 1938 but it was not until 1946 that the first crude oil was shipped. Oil production started from Rawdhatain in 1955 and Minagish in 1959. KOC started gas production in 1964. It was the cheap oil and gas being shipped from Kuwait that formed the economic basis for Gulf's diverse petroleum sector operations in Europe, the Mediterranean, Africa, and the Indian subcontinent. These last operations were coordinated by Gulf Oil Company, Eastern Hemisphere Ltd (GOCEH) from their offices at 2 Portman Street in London W1. Gulf expanded on a worldwide basis from the end of the Second World War. The company leveraged its international drilling experience to other areas of the world, and by mid-1943 had established a presence in the oil fields of Venezuela as Mene Grande Oil Company. Much of the company's retail sales expansion was through the acquisition of privately owned chains of filling stations in various countries, allowing Gulf outlets to sell product (sometimes through 'matching' arrangements) from the oil that it was "lifting" in Canada, the Gulf of Mexico, Kuwait, and Venezuela. Some of these acquisitions were to prove less than resilient in the face of economic and political developments from the 1970s on. Gulf invested heavily in product technology and developed many speciality products, particularly for application in the maritime and aviation engineering sectors. It was particularly noted for its range of lubricants and greases. Gulf Oil reached the peak of its development around 1970. In that year, the company processed 1.3 million barrels (210,000 m3) of crude daily, held assets worth $6.5 billion ($39.67 billion today), employed 58,000 employees worldwide, and was owned by 163,000 shareholders. In addition to its petroleum marketing interests, Gulf was a major producer of petrochemicals, plastics, and agricultural chemicals. Through its subsidiary, Gulf General Atomic Inc., it was also active in the nuclear energy sector. Gulf abandoned its involvement in the nuclear sector after a failed deal to build atomic power plants in Romania in the mid-1970s. In 1974, the Kuwait National Assembly took a 60 percent stake in the equity of KOC with the remaining 40 percent divided equally between BP and Gulf. The Kuwaitis took over the rest of the equity in 1975, giving them full ownership of KOC. This meant that Gulf (EH) had to start supplying its downstream operations in Europe with crude bought on the world market at commercial prices. The whole GOC(EH) edifice now became highly marginal in an economic sense. Many of the marketing companies that Gulf had established in Europe were never truly viable on a stand-alone basis. Gulf was at the forefront of various projects in the late 1960s intended to adjust the world oil industry to developments of the time including closure of the Suez Canal after the 1967 war. In particular, Gulf undertook the construction of deep water terminals at Bantry Bay in Ireland and Okinawa in Japan capable of handling Ultra Large Crude Carrier (ULCC) vessels serving the European and Asian markets respectively. In 1968, the Universe Ireland was added to Gulf's tanker fleet. At 312,000 long tons deadweight (DWT), this was the largest vessel in the world and incapable of berthing at most normal ports. Gulf also participated in a partnership with other majors, including Texaco, to build the Pembroke Catalytic Cracker refinery at Milford Haven and the associated Mainline Pipelines fuel distribution network. The eventual reopening of the Suez canal and upgrading of the older European oil terminals (Europoort and Marchwood) meant that the financial return from these projects was not all that had been hoped for. The Bantry terminal was devastated by the explosion of a Total tanker, the Betelgeuse, in January 1979 (Whiddy Island Disaster) and it was never fully reopened. The Irish government took over ownership of the terminal in 1986 and held its strategic oil reserve there. In the 1970s, Gulf participated in the development of new oilfields in the UK North Sea and in Cabinda, although these were high-cost operations that never compensated for the loss of Gulf's interest in Kuwait. A mercenary army had to be raised to protect the oil installations in Cabinda during the Angolan civil war. The Angolan connection was another "special relationship" that attracted comment. In the late 1970s, Gulf was effectively funding a Soviet bloc regime in Africa while the US government was attempting to overthrow that regime by supporting the UNITA rebels led by Jonas Savimbi. In 1975, several senior Gulf executives, including chairman Bob Dorsey, were implicated in the making of illegal "political contributions" and were forced to step down from their positions. This loss of senior personnel at a critical time in Gulf's fortunes may have had a bearing on the events that followed. Gulf's operations worldwide were struggling financially in the recession of the early 1980s, so Gulf's management devised the "Big Jobber" strategic realignment in 1981 (along with a program of selective divestments) to maintain viability. The Big Jobber strategy recognized that the day of the integrated, multi-national oil major might be over, since it involved concentrating on those parts of the supply chain where Gulf had a competitive advantage. In the late 1930s, Gulf's aviation manager, Maj. Alford J. Williams, had the Grumman Aircraft Engineering Corporation construct two modified biplanes, cleaned-up versions of the Grumman F3F Navy fighter, for promotional use by the company. Wearing Gulf Oil company colors and logos, the Grumman G-22 "Gulfhawk II", registered NR1050, was delivered in December 1936, and in 1938 Maj. Williams flew it on a tour of Europe. A second scavenger pump and five drain lines were added to the engine installation that allowed the aircraft to be flown inverted for up to thirty minutes. This aircraft is now preserved in the National Air and Space Museum in Washington, D.C. A second airplane, the Grumman G-32 "Gulfhawk III", registered NC1051, was delivered on May 6, 1938. Impressed by the Army Air Force in November 1942 for use as a VIP transport and designated a UC-103, it crashed in the southern Florida Everglades in early 1943. Gulf Oil was the primary sponsor for NBC News special events coverage in the 1960s, notably for coverage of the U.S. space program. The company used the connection to its advantage by offering giveaway or promotional items at its stations, including sticker sheets of space mission logos, a paper punch-out lunar module model kit, and a book titled "We Came in Peace," containing pictures of the Apollo 11 moon landing. Gulf was also a major sponsor of Walt Disney's Wonderful World of Color, which also aired on NBC. Disney magazines and activity books were often given away with a gas fill-up. Gulf was also noted for its "Tourgide" road maps. One particularly memorable Gulf advertisement carried by NBC during their coverage of the Apollo missions showed aerial and onboard views of the Universe Ireland with Tommy Makem and the Clancy Brothers singing "Bringin' Home the Oil" – a tribute to the opening of Gulf's operations in Bantry Bay. Gulf Oil was most synonymous for its association with auto racing, as it famously sponsored the John Wyer Automotive team in the 1960s and early '70s. The signature light blue and orange color scheme associated with its Ford GT40 and Porsche 917 is one of the most famous corporate racing colors and has been replicated by other racing teams sponsored by Gulf. Much of its popularity is attributed to the fact that in the 1971 film Le Mans, Steve McQueen's character, Michael Delaney, drives for the Gulf team. As a result of McQueen's increasing popularity following his death and the increasing popularity of the Heuer Monaco which he wore in the film, TAG Heuer released a limited edition of the watch with the Gulf logo and trademark color scheme. In the same era, Gulf Oil also sponsored Team McLaren during the Bruce McLaren days, which used a papaya orange color scheme with Gulf blue for lettering. From 1963 to 1980, Gulf Oil had a formal agreement with Holiday Inn, the world's largest lodging chain, for which Holiday Inns in the U.S. and Canada would accept Gulf credit cards for food and lodging. In return, Gulf placed service stations on the premises of many Holiday Inn properties along major U.S. highways to provide one-stop availability for gasoline, auto service, food and lodging. Many older Holiday Inns still have those original Gulf stations on their properties, some in operation and some closed, but few operate today as Gulf stations. Gulf No-Nox gasoline was promoted with a bucking horse leaving an imprint of two horseshoes. Several promotions centered on the two horseshoes. In 1966 bright orange 3-D plastic self-adhesive horseshoes for car bumpers were given away. Another popular giveaway was during the 1968 election season, gold horseshoe lapel pins featuring either a Democratic donkey or a Republican elephant. By 1980, Gulf exhibited many of the characteristics of a giant corporation that had lost its way. It had a huge but poorly performing asset portfolio, associated with a depressed share price. The stock market value of Gulf started to drop below the break-up value of its assets. Such a situation was bound to attract the interest of corporate raiders, although a corporation in the top 100 of the Fortune 500 was in the early 1980s thought immune to takeover risk. Its undoing as an independent company began in 1982 when T. Boone Pickens, an Amarillo, Texas oilman and corporate raider (or greenmailer), and owner of Mesa Petroleum, made an offer for the comparatively larger (but still considered "non-major" oil company) Cities Service Company (more generally known by the name Citgo) from Tulsa, Oklahoma, which was then trading in the low 20s. Pickens first privately offered $45 a share for a friendly takeover and then later made a $50 a share public offer when Cities' CEO rejected the friendly offer. Gulf forestalled Mesa's takeover attempt by offering $63 a share in a friendly offer which Cities (by then trading at $37) accepted. Cities then bought out Pickens for $55 a share. Once Pickens was gone, Gulf reneged on its buyout offer, supposedly over a dispute regarding accuracy of Cities Service's reserves, and the stock price of Cities plunged, triggering stockholder lawsuits as well as distrust for Gulf's management on Wall Street and among financing investment banks who bet big in assisting Gulf to defeat Mesa only to be left broke when Gulf backed out. Cities Service was ultimately sold to Occidental Petroleum, and the retail operations were resold to Southland Corporation, the operators of 7-Eleven stores. Gulf's termination of the Cities Service acquisition resulted in more than 15 years of shareholder litigation against Gulf (and later Chevron). With declining margins in the industry and left without Citgo's reserves, Mesa and its investor partners kept hunting for a takeover target, only to discover while fighting Gulf for Citgo how increasingly top-heavy its portfolio and declining reserves were undervaluing its overall assets. They subtly but quickly acquired 4.9 percent of Gulf Oil's stock by early fall 1983, just shy of having to declare themselves and their intent at 5 percent to the SEC. In the ten days allowed to prepare the SEC filing, Mesa and its investor partners accelerated buying to 11 percent of the company's stock, larger than the founding Mellon family's share, by October 1983. Gulf responded to Mesa's interest by calling a shareholders' meeting for late November 1983 and subsequently engaged in a proxy war on changing the corporation's by-laws to minimize arbitrage. Pickens made loud criticisms of the existing Gulf management and offered an alternative business plan intended to release shareholder value through a royalty trust that management argued would "slim down" Gulf's market share. Pickens had acquired the reputation of being a corporate raider whose skill lay in making profits out of bidding for companies but without actually acquiring them. During the early 1980s alone, he made failed bids for Cities Service, General American Oil, Gulf, Phillips Petroleum and Unocal. The process of making such bids would promote a frenzy of asset divestiture and debt reduction in the target companies. This is a standard defensive tactic calculated to boost the current share price, although possibly at the expense of long-term strategic advantage. The target shares would rise sharply in price, at which point Pickens would dispose of his interest at a substantial profit. Gulf management and directors took the view that the Mesa bid represented an undervaluation of the Gulf business as a long-term going concern and that it was not in the interest of Gulf shareholders. James Lee, Gulf's CEO and chairman, even claimed during the November 1983 shareholders meeting to address the Mesa ownership that Pickens' royalty trust idea was nothing more than a "get-rich-quick scheme" that would undermine the corporation's profit potential in the coming decades. Gulf, therefore, sought to resist Pickens by various means, including refiling as a Delaware corporation, voiding the ability of shareholders to cumulatively vote (fearing that Pickens would use his shares to gain control of the board) and listening to offers from Ashland Oil (which would double Gulf's price from its pre-Mesa level), General Electric (two years before it took over the media company NBC/RKO) and finally Chevron to act as its white knight in late 1984. Gulf divested many of its worldwide operating subsidiaries and then merged with Chevron by the spring of 1985. The Mesa group of investors was reported to have made a profit of $760 million ($1,675.0 million today) when it assigned its Gulf shares to Chevron. Pickens has claimed that after realizing a more than doubling of stock appreciation for Gulf shareholders (as well as its management that fought him at every turn), Mesa's shares were the last to be paid out by Chevron. The forced merger of Gulf and Chevron was controversial, with the U.S. Senate considering legislation to freeze oil industry mergers for a year—before the Reagan administration made it known it opposed government intervention in the matter and would veto any bill. However, Pickens and Lee (Gulf's CEO) were summoned to testify before the Senate months before the merger was hammered out and the matter was referred to the Federal Trade Commission (FTC). The FTC only approved the deal subject to strict conditions. Never before had a "small operator" successfully taken apart a Fortune 500 corporation, or in Gulf's case a "Fortune 10" corporation. The merger sent even deeper shock waves through the long-time exclusive "Seven Sisters" club of major integrated oil companies that defined themselves as elevated from the "non-major independents". A board member of Exxon even admitted in the mid-1980s that "mostly all we talk about in board meetings anymore is T. Boone Pickens". Chevron, to settle with the government antitrust requirements, sold some Gulf stations and a refinery in the eastern United States to British Petroleum (BP) and Cumberland Farms in 1985 as well as some of the international operations. The effect on the Pittsburgh area was severe as close to 900 PhD and research jobs and 600 headquarters (accounting, law, clerical) jobs were transferred to California or cut, a payroll of $54 million ($123.2 million today) and corporate charity to 50 Western Pennsylvania organizations worth $2 million/year ($4.6 million/year today). These losses were mitigated some with the donation of Gulf Labs in suburban north Pittsburgh to the University of Pittsburgh to be used as a research business incubator along with $5 million ($11.0 million today) in maintenance and seed money. The "Gulf Labs" research complex consisted of 55 multi-story buildings with 800,000 square feet (74,000 m2) on 85 acres (34 ha) and including several chemical labs, petroleum production and refining areas and even a nuclear laboratory complete with reactor in 1985 and employed close to 2,000 engineers and scientists operating with a $100 million budget ($228.2 million today) from Gulf/Chevron. After its donation, it was renamed the University of Pittsburgh Applied Research Center or U-PARC and opened to small technology, computer and engineering firms as well as graduate level research. BP, Chevron, Cumberland Farms and other companies that acquired former Gulf operations continued to use the Gulf name through the early 1990s. This caused consumer confusion in the US retail market as the parent companies would not accept each other's credit cards. All former Gulf stations franchised by BP and Chevron in the United States have since been converted to those names. Gulf Oil Limited Partnership (GOLP), based in Framingham, Massachusetts, has bought a license for North American rights to the Gulf brand from Chevron. Chevron still owned the Gulf brand, but was making almost no direct use of it. In January 2010, GOLP bought the entire brand from Chevron and began a nationwide expansion campaign. GOLP operates a distribution network reaching from Maine to Ohio. Most Gulf-branded filling stations in North America are owned by Cumberland Farms of Framingham, which owns a two-thirds interest in GOLP. In addition there are some independently owned franchises still operating under the Gulf brand within North America, such as the American Refining Group, which is licensed by Chevron to blend and distribute Gulf-branded lubricants. Gulf Oil International (GOI): owns the rights to the Gulf brand outside the United States, Spain & Portugal. It is now owned by the Hinduja Group. After they acquired a large share from the Taher family, a major Saudi Arabian family led by Dr. Abdulhadi H. Taher (former governor of the Saudi Petroleum and Mineral organization and board member of Aramco). GOI trades mainly in lubricants, oils, and greases. GOI is also involved in franchising the Gulf brand to operators in the petroleum and automotive sectors; Gulf-branded filling stations can be found in several countries including the UK, Belgium, Germany, Ireland, the Slovak & Czech Republics, the Netherlands, Jordan, Finland and Turkey. GOI has direct and indirect interests in a number of businesses that use the Gulf brand under license. The Canadian exploration, production, and distribution arm of Gulf Oil was sold to Olympia and York in 1985. From 1992 it continued as an independent oil company (Gulf Canada Resources) until its acquisition by Conoco in 2002. Most Gulf downstream operations in Europe were sold to the Kuwait Petroleum Corporation in early 1983. The associated Gulf filling stations were converted to trade under the Q8 brand by 1988. However, attempts to sell Gulf Oil (Great Britain) to KPC failed because of irrevocable GOC guarantees given earlier in regard to bonds issued to finance the construction of refinery facilities in the UK. GO(GB) was taken over by Chevron and its stations continued to use the Gulf brand name and insignia until 1997 when the network was sold to Shell, although by this stage a fairly large proportion of Gulf stations were supplied by jobbers rather than Gulf Oil (GB). Gulf completely withdrew from the UK in 1997. This represented the end of the last major "downstream" use of the Gulf brand by Chevron. GOI and GOLP continue to sell Gulf-branded lubricants worldwide through a network of official licensed companies, joint ventures and wholly owned subsidiary companies. Many of these official Gulf distributors carry out local marketing and sponsorship which help to raise the profile of the brand. Of these wholly owned subsidiaries Gulf Oil Corporation India has raised the market profile of the Gulf brand in the Middle East. GOCL have emerged as one of leading lubricants brands in India and run many marketing sponsorships targeted at the ever-growing youth sector in the country. GOI licenses the Gulf brand and logo in the UK to the Bayford group, one of the largest independent fuel distributors. Starting in 2001, a new Gulf network of independent stations is slowly reappearing across the UK. At present, many of these stations are notable for offering genuine leaded four-star petrol, for which Bayford has a special dispensation to sell. At the same time, Gulf Lubricants (UK) Ltd was set up to market Gulf products (mostly manufactured by the Gulf Netherlands operation) in the UK. This return by Gulf to the UK after a four-year absence used the slogan "The Return of the Legend." The post-2001 Gulf presence in the UK is a wholly network-based operation. It involves almost no direct Gulf investment in fixed assets, corporate infrastructure, or manufacturing capability. This is a complete contrast to the pre-1997 presence. In January 2010, after using the name since 1986, GOLP acquired all right, title and interest in the Gulf brand name in the United States and announced plans to expand the use of the Gulf brand beyond its parent company's Northeastern United States base. Its promotions have included sponsorship of major sporting events in the area with advertisements for Gulf in New York City, Boston, Philadelphia, and Pittsburgh. To take one case as an illustrative example of the Gulf revival, after Texaco's 2001 merger with Chevron, many former Texaco stations in Pittsburgh switched to Gulf since Chevron does not service the Greater Pittsburgh area. As a result, the Texaco brand name disappeared from the area in June 2004 when the nonexclusive rights agreement with Shell expired, with Shell itself expanding in the area by means other than Texaco but, on June 2006 Chevron gave exclusive rights to the Texaco brand name in the U.S. and sold some BP gas stations in the southeast which were Gulf gas stations. In New England, former Exxon stations have been rebranded as Gulf, in accordance with the consent decree that allowed the merger of Exxon and Mobil. Many of the former Exxon stations feature a rectangular logo that fit into the existing sign standards used by Exxon. Gulf refers to the look as its "sunrise" imaging. The Gulf logo is still used around the world by various businesses. GOI uses it for their marketing activities to focus on the sponsorship of Le Mans race teams (with the current team being Aston Martin Racing team) This sponsorship is used across the world by Gulf distributors, alongside local activity demonstrating the GOI company ethos of "your local global brand". In 2009, the clothing store chain Old Navy began selling T-shirts bearing the old Gulf logo, along with the former logos of Standard Oil and Chevron. Between 1980 and 2000, Gulf moved from being a monolithic, vertically integrated multinational corporation to being more of a network of allied business interests. This has given the entire Gulf enterprise a high degree of strategic and operational flexibility. It is a move that reflects fundamental change in the economics of international business. Alliances represent yet another shift in the organization of economic transactions from organizational hierarchies to networks; from mass to flexible production; from large, vertically integrated organizations to disintegration and horizontal networks of economic units; from "Fordist" to "post-Fordist" companies. In March 2016 Gulf MX Announced that will put their own Filling Stations in Mexico,its planned to begin operations on July of the Same Year to Compete with the Local company (PEMEX)(as a Result of the Recent changes in the local laws in matter of Energy and Oil resources) As said by Sergio De La Vega (CEO of Gulf Mexico) in order to improve a better service Gulf will make fidelity programs and dedicated Smartphone Apps. for customers(improving fuel payment into the same,Fuel Administration and better experience with fidelity programs as another additional benefits benefits) adding to modern Service Stations with more quality added services. Adding to that,Gulf will offer franchises to the existing filling station owners to convert them into Gulf Trademark. In 1970, there were nearly 25,000 filling stations in the UK, of which 10,000 were 'independents' (typically, privately owned and supplied by a major or jobber while using a brand under license). By the end of 1999, the number of filling stations had dropped to 13,700 and to 9,700 at the end of 2005. In recent years, filling stations have been closing at a rate of 50 per month. Many of the smaller and independent stations have succumbed to competition from out-of-town supermarkets that undercut local enterprises through sheer volume of sales and shared overheads. The Gulf brand in the UK is licensed by GOI to the Bayford group which specializes in operating service stations on minor trunk roads in rural areas. Bayford supplies about 185 Gulf-branded filling stations in the UK, all of which are independently owned. The Gulf filling stations provide outlets for Gulf-branded oils and lubricants. The illustration shows a typical Bayford/Gulf filling station in the UK, still associated with a service garage, restaurant and retailing facilities. It is in an isolated location, five miles (8 km) south of Wooler in the Cheviot Hills, catering to both local residents and passing tourist traffic. It is not vulnerable to competition from supermarkets and provides something of a local community center. For decades, Gulf operated filling stations on the Pennsylvania Turnpike toll highway system alongside the Howard Johnson's restaurants at the Turnpike's travel plazas (which correspond to European motorway service areas). This began in 1950 with the opening of the Philadelphia Extension, and Gulf added more filling stations as the system was extended. The Standard Oil Company of Pennsylvania (now part of Exxon) had exclusive rights to provide filling station services on the sections of the system that opened prior to 1950, principally the Irwin-to-Carlisle section. In the 1980s, Sunoco was awarded the franchise to operate the filling stations at the Sideling Hill and now-closed Hempfield travel plazas. This led to a bidding war among three of Pennsylvania's most recognizable gasoline brands each time a travel plaza franchise came up for renewal. Gulf had the opportunity to become the exclusive provider of filling stations at travel plazas along the Pennsylvania Turnpike after Exxon withdrew from the Turnpike in 1990. Cumberland Farms (owner of the Gulf brand in the northeastern U.S.) was awarded a new contract with the Pennsylvania Turnpike Commission, but the contract was sold to Sunoco two years later as part of the company's bankruptcy proceedings. In June 1992, all of the former Gulf filling stations on the Turnpike (as with the Exxon ones before it) converted to Sunoco. All of the travel plazas continue to sell Sunoco fuel today. Most filling stations in Europe sell three types of fuel: unleaded, LRP, and diesel. Although these products lack any real brand differentiation, this has not always been the case. Until well into the 1970s, Gulf (in common with other oil companies) sold distinctive brands of petrol/gasoline including subregular Gulftane, Good Gulf regular, Gulf No-Nox premium, and Gulf Super Unleaded (aka Gulfcrest). Gulf petrol was sold using the slogans "Good Gulf Gasoline," and "Gulf – the Gas with Guts." Gulf service stations often supplied customers with pens and key rings bearing these slogans. For a few years, beginning in 1966, Gulf stations in the U.S. gave away orange plastic "Extra Kick Horseshoes" to customers who filled their tanks with Gulf's No-Nox premium gasoline (the novelty items were commonly mounted on bumpers). GOI still produces and sells a wide range of branded oil based products including lubricants and greases of all kinds. These include products for a variety of applications ranging from metal working oils to refrigeration oils. Car engine oils include the Gulf Formula, Gulf MAX, and Gulf TEC ranges. Heavy duty diesel engine lubricants include the Gulf Supreme and Gulf Superfleet ranges. ↑ Peck, Malcolm C. (December 20, 2007). Historical dictionary of the Gulf Arab states (Second ed.). Scarecrow Press. p. 115. ISBN 978-0-8108-5463-5. ↑ Vassiliou, M. S. (September 24, 2009). The A to Z of the Petroleum Industry. Scarecrow Press. p. 140. ISBN 978-0-8108-7066-6. Retrieved 2013-07-24. ↑ Randall, Stephen J. (2005). United States Foreign Oil Policy Since World War I: For Profits And Security. McGill-Queen's Press – MQUP. pp. 72–73. ISBN 978-0-7735-7540-0. Retrieved 2013-07-24. ↑ "U.S. Business Opens the Great New Barco Oil Fields in Colombia". LIFE. Time Inc. 7 (20): 15. November 13, 1939. ISSN 0024-3019. Retrieved 2013-07-24. ↑ Editors, "The Corpulent Long Islanders", AIR International, Bromley, Kent, UK, March 1976, Volume 10, Number 3, pages 131–133. ↑ Bohn, Earl (March 14, 1985). "Pittsburgh Losing Gulf, May Gain Research Centre". Observer-Reporter. Retrieved January 11, 2014. 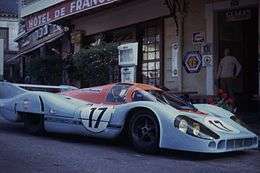 ↑ "Gulf wows the crowds at Le Mans". Gulf Oil. Retrieved 2010-05-05. ↑ "Gulf Oil Partners With Hyperfuels | NACS Online – News & Media Center – News Archive". Nacsonline.com. July 19, 2013. Retrieved January 11, 2014. ↑ "Gulf Brand Returns to the Race Track – Fuels – Convenience Store News". Csnews.com. July 19, 2013. Retrieved January 11, 2014. ↑ Friedman, Arthur R. (March 25, 1953). "Gulf Oil Profit Shows Moderate Gain Over 1951". Pittsburgh Post-Gazette. Retrieved January 11, 2014. ↑ Gould, Lee (January 14, 1976). "Dorsey Resigns as Gulf Oil Head". Lewiston Evening Journal. Retrieved January 11, 2014. ↑ Noonan, John Thomas (1988). Bribes. University of California Press. p. 638. ISBN 9780520061545. Retrieved January 11, 2014. ↑ Barmash, Isadore (April 2004). The Chief Executives. Beard Books. p. 102. ISBN 9781587982286. Retrieved January 11, 2014. ↑ "BUSINESS PEOPLE – Gulf Oil's President Elected Chairman". NYTimes.com. July 15, 1981. Retrieved January 11, 2014. ↑ MacLeod, Scott (January 13, 1977). "Gulf's Boss on Scandal: "It Won't Happen Again"". The Pittsburgh Press. Retrieved January 11, 2014. Wikimedia Commons has media related to Gulf Oil.